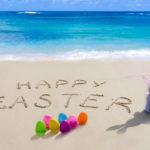 As reported a fortnight ago, having only managed to get one race completed over the scheduled weekend of this year’s Nationals, racing on Good Friday was re-arranged so that the Nationals could be completed. 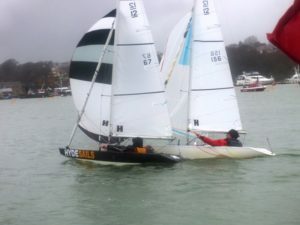 Although at one stage earlier in the week the forecast threatened another visit of the ‘Beast from the East’, in the event it was just wet, very wet – particularly for the Race Officers who were downgraded to a launch for their Committee Boat as Sea Breeze was required for the first race of the Bembridge One-Design season. 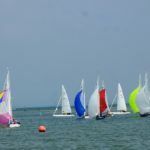 With virtually no wind in the harbour, it was decided to start the first few races outside the harbour off Silver Beach and if the breeze and swell increased, move back into the harbour. After a short postponement, the start of the first race should probably have been a General Recall as it was almost impossible to be certain who was OCS, but with the X Flag displayed, the only identified boat not to return and therefore be scored OCS was Jack Groggan’s black Illusion. Graham Bailey and Bruce Huber were the first to the windward mark and were never brought under much pressure by the chasing pack. They were neck and neck throughout the two round race but Graham picked the better leeward gate mark and finished a few boat lengths ahead. Julia Bailey was third & Raymond Simonds was fourth. The start of the second race was spot on and with the breeze flicking 10 degrees at times, most kept to the centre of the course so as to be best placed for the changes. Graham Bailey and Raymond Simonds lead round the windward mark and as in the previous race, managed to get well ahead of the rest of the fleet. Jo Downer and youngest son Alex were at the head of the chasing boats but never really looked like overtaking the leaders. 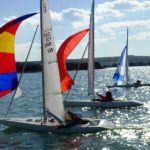 With the sea conditions building in the increasing breeze, it was decided to try to get one more race in before moving the course into the harbour. In the event, the start of the third race ended in a General Recall and then half way through the re-start under Flag U, there was a 30+degree wind shift to the south and rather than trying to re-set all the marks, the AP was displayed and everyone was directed back into the harbour. Other than no let up in the rain, the difference in conditions was dramatic. Indeed initially it looked as if there was not going to be enough wind to sensibly race, however fortunately the breeze did pick up as the third race got underway. As it turned out it was something of a Downer benefit race; Raymond Simonds took first but Mark, Jo and Alex took the next three places. The fifth race saw another General Recall with the re-start under Flag U and a very cold John Raymond heading back to the Illusion Quay after being OCS. With the breeze steadying down nicely, it was Jack Groggan who emerged as the leader at the windward mark ahead of Graham Bailey and Bruce Huber. Despite lots of pressure, Jack held his nerve and finished the two round race still in front. Mark was fourth. 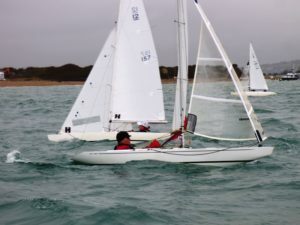 The sixth and final race was George Downer’s; indeed he was so far ahead at the end of the first round that the race was on as to who was going to take the next three places between Raymond Simonds, Jack Groggan, Bruce Huber, Mark Downer and Graham Bailey. However, at the finish at the windward mark after two and a half rounds, it was Raymond and Jack who took second and third. Andy Christie overcooked the start so was first back to the crane! It was certainly an unusual Nationals but no one seemed to mind; especially not the winners! Congratulations to the overall winner, Graham Bailey, the runner up Raymond Simonds (who also took the first over 65 prize) and in third place, last year’s Champion, Mark Downer. Jack Groggan was the first Visitor, George Downer was the first under 25, Jo Downer was the first Lady and the most improved from last year; Robin Ebsworth was the first over 75. Tomorrow (Easter Saturday) we have Vernon’s Easter Egg – let’s hope the rain has stopped!